Here’s an early Christmas present: the digital edition of TANGLED IN TIME, the steampunk romance novella by Pauline B. Jones, went on sale ahead of schedule. 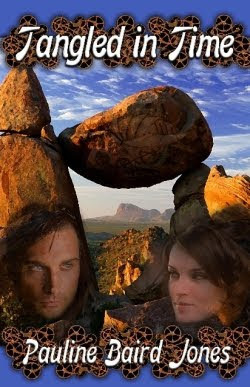 Readers can purchase this ebook at All About Romance and Omnilit. A Kindle edition is also available. I read an advanced copy of this story ages ago, and of all the steampunk romances I’ve read to date, it’s one of my favorites. TANGLED IN TIME works to some extent as a stand alone, but it’s best read as part of the author’s ongoing series that begins with her novel THE KEY.